I’ve known for a little while now I wasn’t going to bother with the PS3 unless some truly unique titles come up and the price subsequently drops so buying one at launch was a no-no for me but once I found out only two of my friends were getting them (and I have a lot of geeky friends) I knew Sony were in trouble. A quick browse shows Amazon.co.uk still have some available, Play have them left, hell even my local HMV here on the tiny island of Guernsey had over 100 unallocated at lunch today and had canceled their midnight launch event – albeit for ‘technical’ reasons. People on eBay have been finding their pre-order auctions not even meeting their cost price and looking at the negative feedback they are refusing to honor them now. Cutting backwards compatibility when costs aren’t even passed on to the consumer? But as we have made clear before, in the future our resources will be increasingly focused on developing new services and entertainment features exclusively for PS3, rather than on delivering PS2 backwards compatibility. Forcing Blu-Ray upon consumers when they have failed with so many proprietary formats already? Nothing worth playing at launch? 27 launch titles, 6 exclusive titles for sale plus Gran Turismo HD Concept free download. Gran Turismo HD Concept looks interesting … but not £425 to play essentially a demo interesting. Resistance: Fall of Man and MotorStorm are the top selling titles with EuroGamer scores of 6 and 8 respectively. Pathetic attempt at on-line service in the face of Xbox Live!? Dropping rumble in exchange for a not-as-good-as-Wii movement sensor? Of course it comes down to just one thing: Give people what they want, not what you want them to have. I doubt Sony can stop their downward trend whilst they exude arrogance that sounds like “you’ll take this and you’ll like it – we’re Sony”. 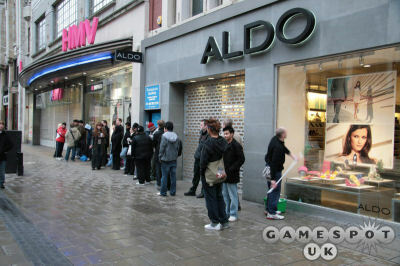 In order to try and save face Sony performed a PR stunt by giving away 46″ HD TV’s to everybody who brought a PS3 at the Virgin London store. This would hopefully mean the press and sites would write about this instead of poor turnout or nothing at all – a snip at £250,000 to Sony. Check out the BBC, GameIndustry.biz or UK Resistance for coverage of the launch event. Yeah, pathetic turn-out all round with reports of media outnumbering shoppers at a couple of events, general disappointment and even big venues getting under 100 people. On-line retailers such as Amazon and Play have plenty left. Last night 50 regional HMV stores were open for midnight launches across the country, and “at least” 1,000 units had been sold, according to Ellis. The Xbox 360 enjoyed its second year and titles continue to impress although the count is still a little on the weak side. The addition of 1080p output was a great bonus but one many people (myself included) can’t take advantage of without a HDMI cable and nobody seems entirely sure if the 360 can pump out a digital video signal (I doubt it). On-line support is blooming although can get very expensive if you want all the extras for games you’ve already paid for – come on guys we put £40 down gives a few freebies! Nintendo’s Wii has been getting a lot of press for being fun (if tiring and occasionally dangerous to your environment) but with the console itself is effectively a re-boxed GameCube which didn’t impress 5 years ago and the graphics look very dated on the couple of titles I’ve been able to see. With rumors of a more powerful unit doing the rounds and nothing stopping anyone producing a similar controller for the 360 or PS3 can Nintendo stay a contender or will they go the way of Sega? With consoles traditionally being loss-leaders for the first few years perhaps Nintendo would have been better off producing controllers and software for the 360 and PS3. People often rave about how open-ended Grand Theft Auto is but lets be honest here – it isn’t a patch on Oblivion. Like the aforementioned title you can follow the story or run off and do what you like. The difference here is that Oblivion is truly massive and is filled with interesting people, their stories and ultimately their sub-quests. The graphics look absolutely gorgeous and show off the Xbox 360 very well – demands on the PC side are beyond what my desktop can deliver. Microsoft took a brave step in reinventing the menu/tool bar that has been established for the last 10 years. Sure, the result isn’t a giant leap in terms of innovation but it is a joy to use and a big improvement over the older technology. Importantly it shows a beacon of hope that there are people at Microsoft prepared to fundamentally change how people use their software for the better and not just deliver to developers (.NET, XML-HTTP). We were told repeatedly that this would be the year of high-definition yet despite large sales of HD ready equipment the content is still a bit thin on the ground (Sky HD, Xbox 360 and a smattering of HD titles). Sony hit another strike this year as another of their proprietary formats bombed – UMD video for the PSP – although sales of TV shows on Apple’s iTunes seem to indicate there is a market for tiny distinctly non-HD video. The real winner on the video front has to be YouTube which goes on to show that whilst content is king there’s no reason you need to pay for it to be successful. Grainy, out of focus and copyright infringement seem the orders of the day but nobody cared – at least until a company worth suing brought them out (Google). HTC phones and their branded variants have been popping up all over the web and in techies hands everywhere. Reviews are generally positive although I’m finding my TyTn sluggish in a couple of areas – something I hope the latest firmware will address. Motorola meantime has been getting bad press over it’s Rokr variants. Apple’s vaporware mobile phone continues to get insane coverage despite nobody having anything but speculation and rumors to go on. Cisco/LinkSys released an iPhone to which they own the trademark so I guess iChat Mobile is an option. Rojo on the other hand deployed a screwed update and continually failed to pick up feeds complaining they were invalid or couldn’t be contacted despite other on-line tools were working just great. Bye. With RSS becoming increasingly more popular something has to give and it’s news aggregation sites such as Slashdot and Digg which often reveal to you news you read several days ago and have already commented about at the original source. * Yeah okay, not a proper award ceremony but a useful ploy to group otherwise unrelated content into a single post. I got a new silver Sony EyeToy for my birthday (along with the EyeToy 3 games, thanks Amy!) and found that it didn’t want to play with Windows. The earlier black model worked just fine with a modified INF file and so it was back to notepad to slip in the required lines. Rather than give instructions on messing round with downloading other people’s drivers and editing .inf files I’ve just packed it all up. Shopping on-line from the Channel Islands isn’t always a pleasant experience. Many companies can’t be bothered with the making a VAT-exempt outside-EU sale and when they do they like to use expensive shipping options instead of the often reliable and cheap Special Delivery service. Here’s a few tips and sites to make things a bit less painless. HotUKDeals keeps track of various discounts, vouchers, codes and deals that can be had on various popular UK sights. Not all the vendors here deal with the Channel Islands but many do so it’s worth checking. Many companies offer referral schemes these days in an attempt to get more business in exchange for a few % or £ going to the referrer. When you join QuidCo always purchase by following their link to the vendors site (clear those cookies first to be sure) and when you order they’ll pick-up that referral fee… and give it back to you. Membership costs £10 a year which funds QuidCo itself but it doesn’t take many purchases to earn that back. Current paybacks include… Sky new customer (£50), Dell (to 6.5%), Boots (to 4.5%), Play (2%), HMV (6%), BlahDVD (5%), Woolworths (5%), WHSmith (7%), I Want One Of Those (10%), Toys for Me (12%), BBC Shop (7.5%) and many more. Officially iTMS can’t be bothered with the Channel Islands just like the Apple Store itself however if you don’t mind paying the 17.5% VAT then enter your post code in lower case to bypass the check. This has been working for a year or so but I guess sooner or later somebody will patch this oversight. Sony Station is the portal and package for many of Sony’s popular on-line games including EverQuest, Star Wars: Galaxies, Matrix Online and PlanetSide. Once again they fail to list Guernsey, Jersey or Channel Islands but a customer service rep has told us to set our country to Zimbabwe to ensure we don’t pay somebody else’s sales tax. Cheap airfare sites for trips to/from the islands – the local airlines don’t discount beyond what’s already on their sites. Discounted mobile phone sites – the only two local operators are Cable & Wireless Guernsey and Wave Telecom. Both offer phones through their town stores and via a number of local agents only. ISP comparison/deal web sites – we only have the choices of Cable & Wireless Guernsey and Guernsey.Net/NewTel.